MANY Australian U2 fans were disappointed the Irish supergroup’s The Joshua Tree 2017 Tour won’t hit shores Down Under. 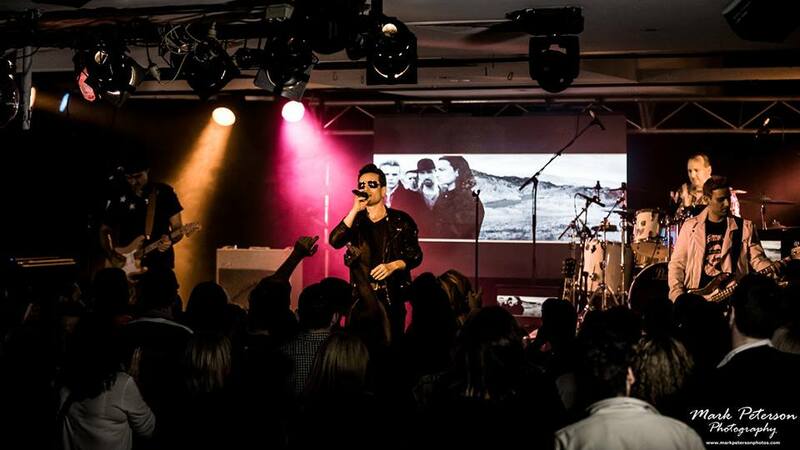 So Melbourne-based tribute band The U2 Show – Achtung Baby have taken matters into their own hands, staging their own version of the tour. U2 Australia caught up with lead singer Michael Cavallaro, who obviously portrays Bono in the band, to find out more about what’s planned. So Michael, how are rehearsals coming along? Rehearsals are going great. There’s a tonne of stuff to learn, considering we only usually play half of the songs from The Joshua Tree. I reckon we will spend at least a night every week for the next seven weeks rehearsing as a band, so we’re well and truly putting ourselves out there. And that doesn’t even count the hours we spend on solo practice. Which songs are coming together quickly? Which ones are providing a challenge? All of them. It’s U2 remember. Give us your memories of when you first heard The Joshua Tree? Sixteen years old sitting by the tennis courts at high school when a friend gave me a copy and suggested I give it a listen. I still remember it vividly. It was a sunny day. When I heard those songs, I was mesmerized. Especially those harmonica parts on Running To Stand Still and Trip Through Your Wires. I was instantly sold. 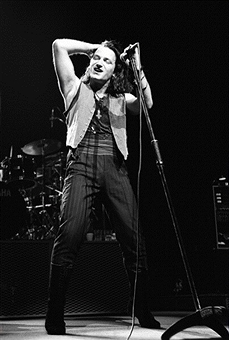 Bono during the original The Joshua Tree Tour. Will Michael Cavallaro go for that look? Why do you think the album has stood the test of time? Those songs speak volumes of the political situation then, and also paints a very vivid picture of what U2 were immersed in during that era – Americana. How are you going hitting those high notes on Red Hill Mining Town? I practice every day. The notes themselves aren’t that high for a tenor like myself. It’s the way Bono gets to those notes is what makes it tricky. The other tricky part is not to get vocally worn out doing it. What’s your favourite track to sing? With or Without You is definitely a favourite of mine. But Trip Through Your Wires is also great fun to sing. Is the band putting together some The Joshua Tree visuals for the show? We sure are. We can’t say more than that though. Got your suspenders, waist band, long leather boots, pin stripe pants ready? What would you rather see come to Australia? The Joshua Tree 2017 Tour or the iNNOCENCE & eXPERIENCE Tour? Indoors or outdoors? Would it be greedy to say both? I don’t think so actually. I’m sure the Australian public would love to see both also. The U2 Show -Achtung Baby play The Joshua Tree anniversary show at The Yarraville Club, 135 Stephen St, Yarraville, on Saturday, May 6, from 8.30pm. Tickets available here or phone (03) 9689 6033.